Which Guitar Legend Wears this Rolex Hulk Submariner? There are few people in this world that achieve the one-name recognition, and Slash is one of them. A legendary guitarist who shot to fame as part of rock supergroup Guns n Roses and later went on to do his own projects, Slash has been playing for well over 35 years. Brash and over-the-top, Slash’s style is iconic as his music. Rarely seen without his signature black top hat, oversized sunglasses, and wild hair, his look is like no other. The Rolex Submariner 116610LV “Hulk” was the watch of his choice. Slash wearing Rolex "Hulk" Submariner ref 116610LV Coachella weekend 2. Slash is back on the road again with the Guns n Roses’ Not in this Lifetime… world tour, joining fellow rock stars Axl Rose and Duff McKagan. And some Rolex fans who’ve seen their recent shows have noticed something new on Slash’s wrist. While Slash has been a loyal Breitling watch wearer for years, he’s now wearing a Rolex. 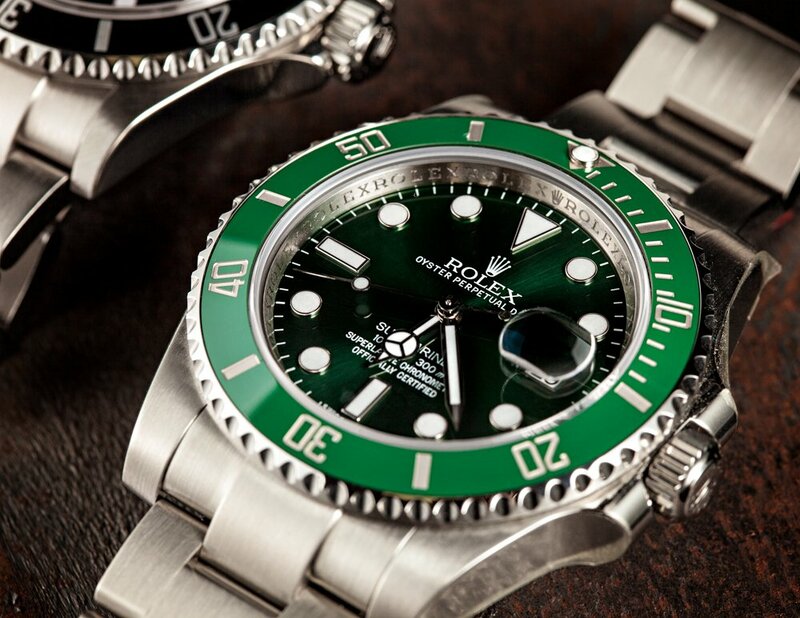 And not just any Rolex, but the instantly recognizable classic green Rolex Submariner nicknamed the “Hulk”. The Rolex Submariner 116610LV made its debut at Baselworld 2010 and because of its bold green color, it didn’t take long for the “Hulk” nickname to stick. As one of Rolex’s current sports watches, the Sub 116610 features all the modern improvements the brand has recently been furnishing their watches with. For instance, the Rolex Submariner ref. 116610LV has the Cerachrom ceramic unidirectional bezel, which is both scratch and fade proof. The markings on the green ceramic insert are coated in platinum and the inverted triangle is topped with a luminescent dot for legibility in low light. Along with the ceramic bezel, the Rolex ref. 116610 also has a new style “Maxi dial” with oversized round luminescent hour markers and fatter Mercedes style hands. The center hands and indexes sit on a matching green colored dial that is actually referred to as “green gold” by Rolex due to its thin coating of pure gold. This green Submariner received its nickname, the Hulk, for a pretty obvious reason. Since the Submariner is Rolex’s quintessential diver’s watch, the 116610LV is waterproof to 1,000 feet (300 meters) thanks to the Triplock winding crown and screw-down caseback. The 40mm stainless steel Oyster case is presented on a matching stainless steel Oyster bracelet. Rolex placed as much thought and care into the bracelet as the rest of the watch. The practical Glidelock system allows wearers to easily adjust the fit of the bracelet to accommodate wearing the Rolex Submariner under a leather jacket or over a wetsuit.